Kalbadevi is an area well known for its wholesale steel market, but it is also an area which plays host to a huge number of temples. It is amazing to note that this small area in the heart of the commercial centre of Bombay has an eclectic mix of places of worship. While there are small and big temples galore dedicated to the Hindu Gods such as Shiva, Vishnu and myriad forms of the Devi, the area also houses two Zoroastrian fire temples, and the whole area is surrounded by mosques! And yes, of course, there are also a couple of churches nearby! Innately personifying the multi-cultural essence of Bombay, the area is a bustling hub of humanity at all and any time of the day! Walking peacefully along any of the roads here is difficult once the shops open in the morning, and one tends to miss out many interesting things while keeping our eyes peeled on the traffic and trying not to bump into our fellow pedestrians. Add this to the fact that a visit to Kalbadevi generally involves buying vessels of all shapes and sizes for us, as well as our family and friends, and you can forget that this is also one of the oldest parts of Bombay, and one of the richest areas in terms of the history of this not-so-old city. Sages depicted on the second level of the temple.... this is what drew my attention. I had noticed this building on my many visits to Kalbadevi, but had no idea what it was. On my last visit, I managed to take a photograph (the one above) and wondered what it was. Was it the residence of some rich merchant, or was it a house of worship? 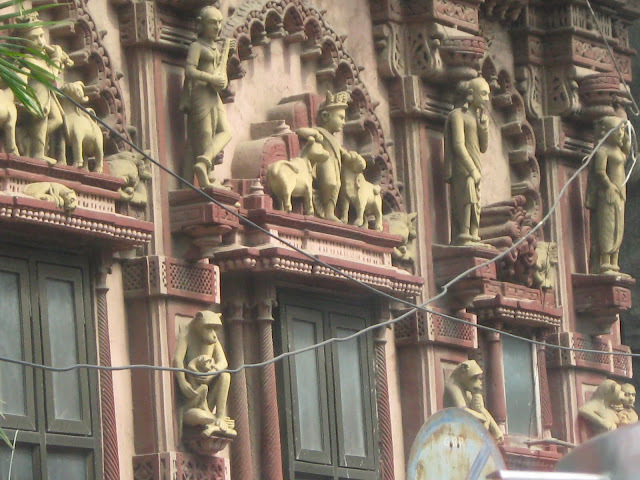 Considering that the area mainly houses merchants, could it be a Jain temple? I finally turned to the internet to satisfy my curiosity, and after much, much searching, found a reference to a ‘monkey temple’! I was stunned! First, it didn’t look like a temple. 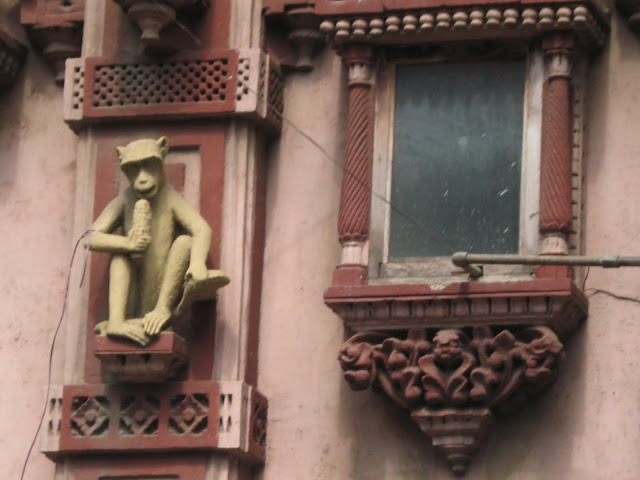 Second, there were no monkeys around, and it couldn’t possibly be a Hanuman temple, so why was it called by such a name? 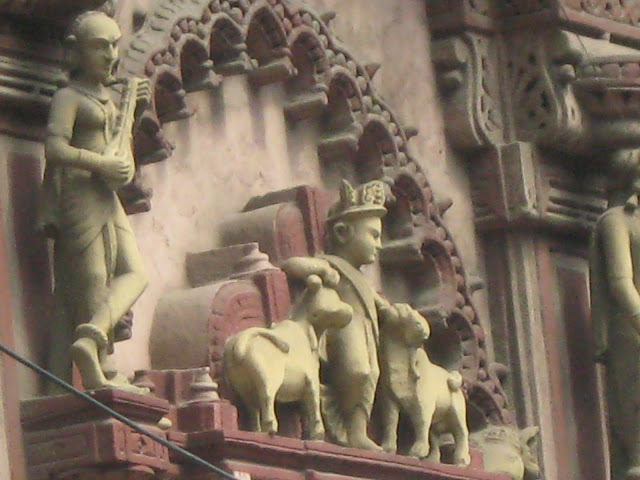 A bit more searching brought forth the information that this was also called the ‘Dwarakadhish Temple’, or Sunderbagh. At last, this made some sense. With so many Gujarati merchants making their living here, this was surely a temple built by them. But a little more searching at last brought me to an article published in the Hindustan Times around two years back, which informed me that this was one of the oldest havelis in Bombay, dating back to 1875! The temple is dedicated to Lord Krishna in his form as Dwarakadhish – the Lord of Dwaraka, and is decorated on the front with monkeys, thus prompting the British to name it the ‘monkey temple’! 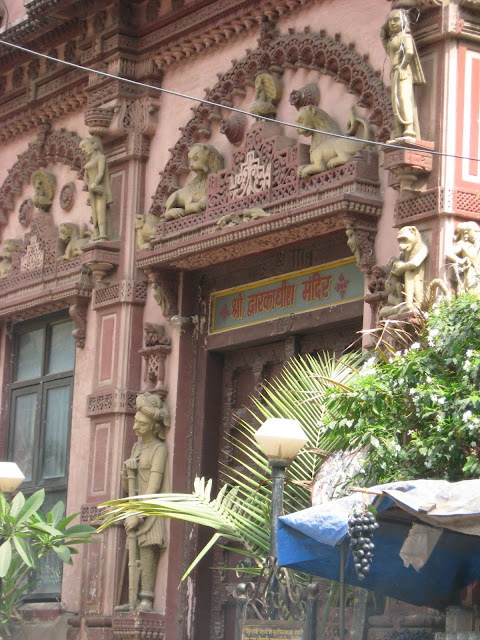 The temple was built by Sunderdas (thus the name Sunderbagh), when his father, Thakar Mulji Jetha dreamt of an idol of Lord Krishna in his house, and found the idol in an old forgotten box under the stairs. 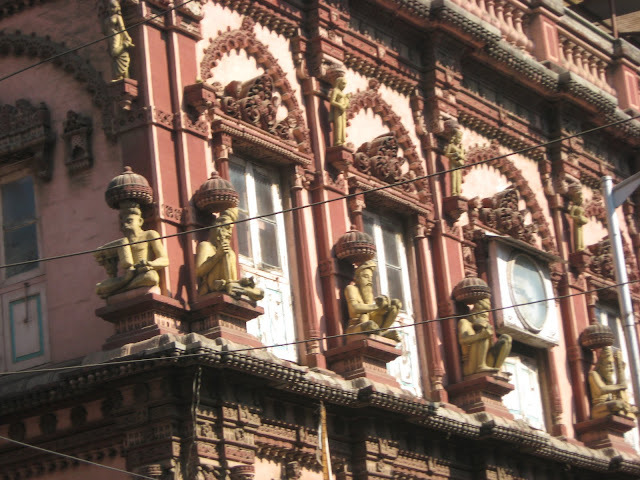 The temple was built on a grand scale and decorated lavishly with murals and sculptures. I haven’t been inside yet, but to know more about it, read the article which appeared in HT here. The side entrance... this has the temple name on it. I only saw it because I was looking for it! A closer look at one of the Krishnas..
Bombay is full of such gems which aren’t really hidden, but which are forgotten in the hustle and bustle of our daily grind. This is just one of them, and one I intend to visit someday to take a closer look. 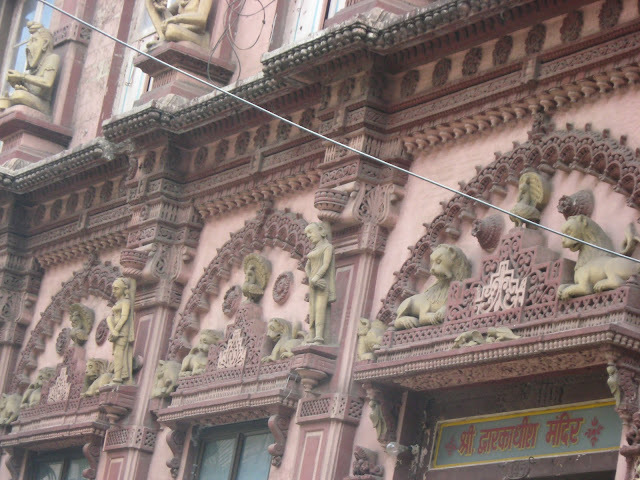 If any of you have visited this temple, please do leave a comment. I happened to visit this temple recently as a part of a project that I am working on. Your article was very helpful in my research! I managed to interview an old man whose office is situated right opposite the temple and he told me that this is the only replica of Dwarkadhish of Dwarka. It shuts at regular intervals, do visit sometime. So good to hear that, Rushikesh!! would love to know more about the temple, so keep me updated!! I grew up a few minutes from this temple. Everyone in our house visits it every other day. It is very beautiful inside. The sculpture you see outside is also inside but in various colours, not just brown and yellow as in inside. You should definitely visit it inside when you get a chance, especially in the evening.